Nov 3/4 18.20 - 20.00 local time. Tonight 17P/ Holmes was a spectacular object to those lucky enough to have dark skies. This was a night of revelation for me. In the 8.5" F/7 reflector I measured the brighter inner coma at 15' in dia. It was a bright lemon colour with beautiful segmented ring around the perimeter like a horse shoe with bright enhancements and dark obscurations. The N side described a beautiful curve with the S section soft and broken in profile. At centre was a very faint and soft false nucleus which looks more like a well defined smudge rather than stellar in the 32mm eyepiece. The dust fan was still bright and elongated to the south where it merged into a vague void of complexity where all the finer action was taking place. Surrounding the FN was 3 dark wedge-shaped holes or pits in the region between the FN and inner coma. By sweeping the telescope back and forth I could see the green transparent outer coma for 30' either side of the inner coma. Since this central region was 15' across I got a total diameter for the outer coma at 75' or 2.5 times the apparent size of the Moon. The other coma has a very sharp edge with obvious cut off point where the coma ended and the background sky began. It was a disk-like shape very much like a CD. This effect was enhanced by the stunning dark 'lip' which surrounded the inner coma like a jet black scarf much like what is now being picked up on CCD images. This dark collar was very well defined and by letting the comet drift across the field I could see its passage with ease as it first entered then drifted in transit across the 1 degree FOV. The shape of this feature reminded me of an 'Arcus' or 'Shelf Cloud' which marks the gust front of a thunderstorm. I observed two long Ion tails, the first to the S and the second to the SE with the first being 1 degree in length. A nice fan of multiple fine streamers spread across the void between these two long linear features where the inner and outer coma meet. My 10x50mm binoculars have a FOV of 5 degrees. Using these I was astounded to see the coma taking up much of the field which I estimated at 3 degrees in dia or 6 full Moon diameters!!. I couldn't believe what I was seeing and was reserving severe doubts about the whole thing until I saw it easily again with well defined edge which flirted with the eastern most stars within the large open cluster between Alpha and Delta Persei. The entire sharp dark green outer coma looked like a smaller version of the Gegenschein during the times when it can be seen as an oval glow. Further more the 'disk' was not a perfect circle. The southern end looked 'missing' as if a wedge shaped section had been cut from the coma with scissors. I recently recall one observer describing this outer coma as shaped like a Jelly Fish and this was more or less what I could see also. Extending from the void in the southern section was a long linear ray of light approx 2 degree long. 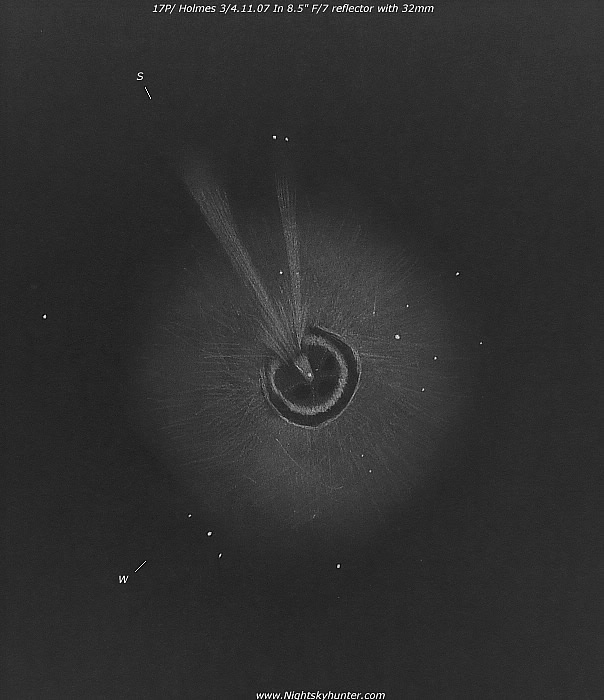 I do not know if this was a long ion tail or just an enhancement along the inner edge of the coma. Confused by the whole thing I decided to delay this observation until I could confirm it myself. Tonight (Nov 4/5) the sky was stunning and very dark. In the 10x50s I could see the same size of coma and shape as observed on the night before. However even more astonishing was the view with the naked eye on this grand night. Using my finger tips held at arm's length I could see the entire coma extending for approx 5 degrees in dia (10 Moon diameters) with the naked eye!! !.